This Waldorf zinc cast table lamp is in a Burnished Brass finish and includes a tapered Pearl Suprem.. 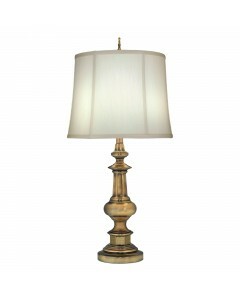 This Washington is a zinc cast table lamp in an Antique Brass finish and includes an Ivory Shadow sh.. This Washington is a zinc cast table lamp in Antique Nickel finish and includes an Off White Silk Sh..